Recipes for puddings in spring time need to bring a fresh flavour, a lightness to your food and your plate. Citrus fruits are abundant at this time of year so we’ve a recipe for oranges that would work equally well with satsumas or clementines, as well as a warming pudding using the fresh young rhubarb that’s now appearing in the shops. And as Pancake Day falls in spring, we’ve a recipe for pancakes too! Pour the water into a small saucepan. Sprinkle over the gelatine and allow to soak for a few minutes. Then stir over a very low heat until the gelatine has dissolved. Remove from the heat and set aside. Squeeze the juice from the fruit and set aside. Add 2 oz sugar to the egg yolks and whisk until pale in colour. Whisk in the fruit juice. Slowly pour the dissolved gelatine into this mixture, whisking constantly while adding and until thoroughly blended. Set aside for about 20 minutes or so, until the mixture shows signs of setting. Meanwhile whisk the egg whites until stiff. Add the remaining sugar and whisk again. Using a metal spoon, fold the egg whites into the yolk mixture. Be gentle but thorough. Pour into a glass serving bowl and leave to set. Serve with cream and some fresh (or freshly defrosted) strawberries or raspberries. Preheat the oven to 190ºC, gas mark 5. 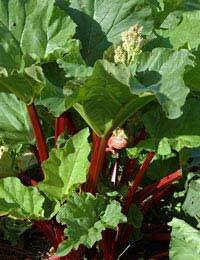 Trim the rhubarb and wash if necessary. Cut into 1” chunks and place in a greased pie dish. Sprinkle the sugar and orange rind over and add the water. Set aside. Sieve the flour and salt together. Beat together the margarine and sugar until light and fluffy. Add the egg gradually, beating well. Fold in the sieved flour. Spread this cake mixture evenly over the rhubarb. Bake for 30-35 minutes until the sponge is well-risen and golden. Serve hot, sprinkled with icing sugar. Ginger goes well with rhubarb. Try adding a little spice to the fruit along with the orange rind. Pancake Day - or Shrove Tuesday - falls the day before Ash Wednesday, which is about 6 weeks before Easter. As the date of Easter changes every year, the only thing we can say for definite is that it will be in the spring sometime! But we don’t need an excuse for eating pancakes! They’re delicious at any time of the year. Sieve the flour and put in a wide bowl. Make a well in the centre and add the egg and half of the milk. Whisk well until bubbles form on the surface. Add the remaining milk and stir well. To cook pancakes, heat a little oil in a small frying-pan – about 7” if you have one. Tilt the pan to ensure the base is all coated with the oil, which should be very hot before you pour in about 1 tablespoon of batter. Tilt the pan again to spread the batter thinly over the base. Over a moderate heat, cook until the underside of the pancake is golden brown. If you’re feeling brave, toss the pancake or simply slide a fish slice underneath and turn it that way. Cook for another minute or so. Turn out onto sugared paper and sprinkle with more sugar and some lemon juice. To keep pancakes warm, place them between 2 plates in a warm oven. Any left-over – as if! – will keep for up to a week, well-wrapped in the fridge. The filling can be as imaginative or as simple as you like. Experiment! Try savoury stuffed pancakes as a supper dish. Hint: the first pancake to be cooked is nearly always a failure! It’s cook’s prerogative to eat it!